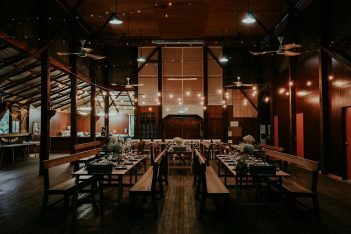 Situated in the Scenic Rim only 90 minutes drive from Brisbane and the Gold Coast, Farringdon is the ideal location for your destination wedding. Whether you dream of teepees, a white marquee or a wedding under the stars, Farringdon has the space for you. Our wedding site, The Stables, comprises a large corrugated iron shed, four fenced acres fronting a small creek and contains a dam and several smaller iron sheds. There are numerous shade trees, one with a swing, and an old rustic farm cart. It is the perfect area for unique wedding photographs. Our accommodation is the ideal place to stay while setting up the site and for the bridal party to prepare on the day. Tastefully furnished air-conditioned rooms sleep four in two spacious rooms with private bathrooms. Farringdon Homestead accommodation is fully catered. Farringdon is a beautiful 1000 acre working beef cattle property. Buses must be arranged to transport guests to and from the venue. The nearest town is Beaudesert, 22 kilometres to the north. Trudy and Ian bought “Farringdon” in 1986. 1000 acres of neglected paddocks with dated cattle yards and two rundown sheds. 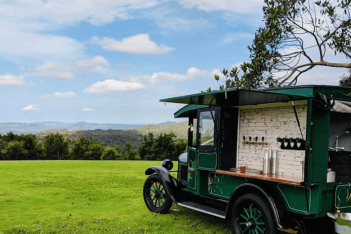 They purchased a worker’s cottage from Western Queensland and it was trucked to its present location, tucked into the slopes of the Jinbroken Range overlooking the mountains and valleys of the Scenic Rim, the border ranges, and the Great Dividing Range beyond. Years of improvements, renovation and hard work have made Farringdon the beauty she is today. Trudy and Ian are very grateful to be living in such a beautiful spot. Country life, with fresh air, peace and quiet is something they love to share with family and friends and now wish to provide you with the perfect óff the beaten track’ wedding destination.